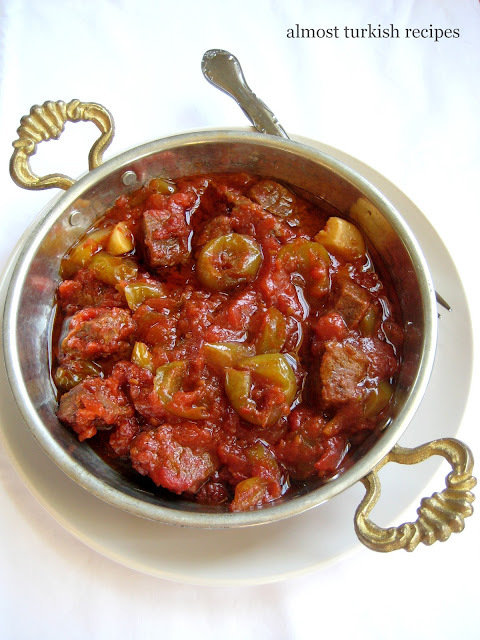 -In a bowl mix stew beef, pepper paste, tomato paste, salt, black pepper, and pepper flakes with your hand. Make sure the beef is well coated with pastes and spices. -Add seeded plums, garlic cloves, and tomatoes. -Place the mixture in a wide and deep oven-safe casserole or in a cast iron dish. -Add boiling water to barely cover the meat ~1 cup. -Cook in a preheated oven at 370F for two hours. 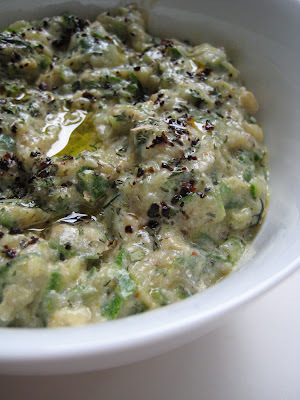 -Serve with rice and/or bread (you'll need both to soak up the divine juice). THANK YOU! I'm American, but developed an obsession with can erik while living in southeast Turkey for two years -- my May this year was saddened by the lack of little carts selling them on every corner. I had this stew at a friend's home in Urfa, and again at Çiya Sofrası in Istanbul - I hope I can find the plums to make it at home in America. Hi Burcu! when did you come back online? Lovely recipes, lovely pics! If you have followed my blog at all, you will know that I too can't stand can eriks. Soooo sour and then with salt!!! But I just used them with etli sarma and surprisingly, their taste totally changed with the cooking and were delicious! So I may well try your recipe. Thanks. I'm smiling because we used to pick green plums from the trees and eat them when I was a kid, then deal with my mother who said they were bad for us! We still ate them, and I can imagine they're wonderful in this dish. Craving something with amazing flavor just like this. I'm a Brit that likes Green plums with salt, but it has taken a lot of practice. This looks delicious. I've never seen green plums, but worst case scenario, I wonder if rhubarb would work? Or sour cherries? @Laura: Interesting idea. Cherries are used in cooking rolled grape leaves for sour effect but i've never thought of using them i this recipe. I think they still have some sweetness to them so they would not work. But tartness of rhubard would do the trick. Wow!! Looks yummy, will surely try this!! 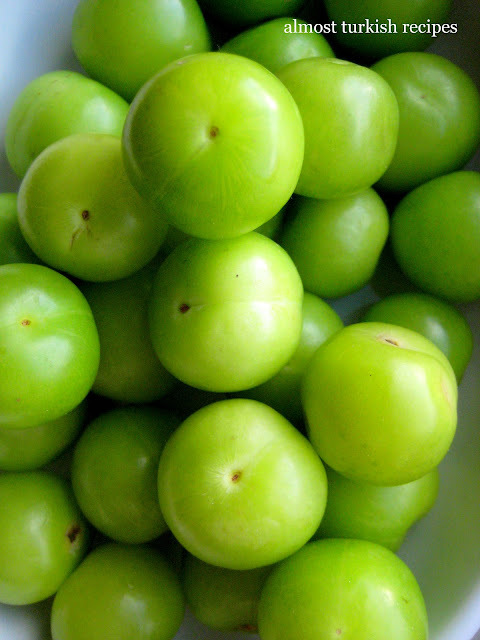 I saw these in my local Turkish shop in north London - I thought they were green tomatoes. The shop owner said no, but didn't know what they were called in English, but told me they were delicious with salt and very good for the teeth, mouth and metabolism. Now I know what to do with them, I am going back tomorrow to buy some! where would i find them in NYC? i love them!! great dish! in Lebanon people love them and we used to eat them dipped in salt; I guess it is a universal snack in the near east; i heard that some people also put them in their pot when making stuffed leaves or dolmas. I also found them sold in Dallas at the middle eastern grocer. Since it is May here in Istanbul, I finally tried this recipe and it was wonderful. The green plums (erik) adds a nice brightness to the flavor of the stew - I developed a taste for them raw but now I am hooked on cooked erik as well. Thanks for this lovely recipe!